I will normally reply within 24 hours! I am looking for an app that will allow me to stream this on my android device when I am not at my computer. I am not looking to download podcasts, but to listen to the live show. Any help would be great, thank you. Hi – My name is Samuel Culper and I run Forward Observer, an intelligence services company. For several years, I’ve done a podcast and I’m seriously considering doing a live radio show once a week starting in 2019. At FO, we specialize in intelligence, security, defense, and have a broad range of topics to discuss; from geopolitics and current events to tactical intelligence and community security. 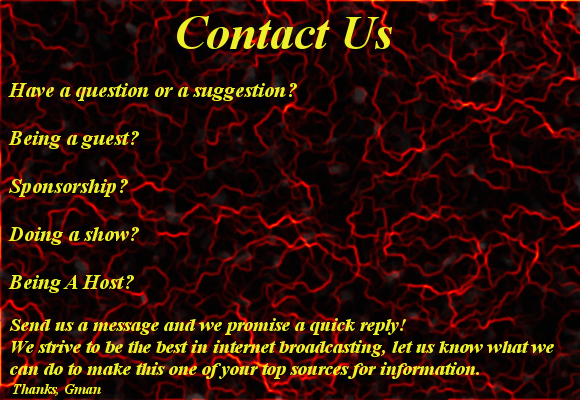 Are you looking for new show hosts? I love FO. I don’t actually have any open spots right now but shoot me an email and I will see what the future holds. Thanks sir. Hi G-Man, It’s Ron aka The Grey Ham. I recently finished the series of my books ParaCW. I would like to renew the advertisement I currently have to include this book. For the time being it is just available in eBook and the paperback version is under review from Kindle. The audiobook is about 1/2 completed according to my author. What is the best way to go about doing this since the book isn’t available in all three formats yet? Also, I’d like to get this done before the end of the year for tax purposes. I read your article on Re: What the World Needs Now is…Preparedness with interest. “This is much more than just a clever bit of wording. All over our world people are facing the forces of this worlds engine”. Could you say more about “this world’s engine”. I think that there are powerful forces behind our government, economy, etc. but I would like to read your thoughts. What can be done to become more secure as a prepper?